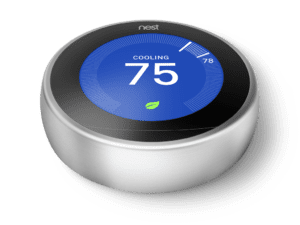 The third gen Nest Learning Thermostat is more beautiful than ever, with a thinner, sleeker design and bigger, crisper display. And it’s proven to help save energy. In independent studies, the Nest Thermostat saved an average of 10% to 12% on heating bill, and 15% on cooling bills. We’ve estimated average savings of $131 to $145 a year. Connect the Nest Thermostat to Wi-Fi to change the temperature from your phone, tablet, or desktop. You”ll see the Leaf when you choose a temperature that saves energy. It guides you in the right direction. When the Nest Thermostat detects you across the room, it lights up beautifully to show you the time, temperature or weather.